The young son of a popular children’s book author vanishes into the dangerous fictional world his father created. And it’s going to take more than a vivid imagination to get him back alive. Incredible. Rarely does a book leave me breathless from its sheer imaginative power. This book took me by surprise. It’s complex and absorbing. It was an old book that was yellowing from having been on my shelf for many years. I probably found in a used-bookstore. Though I appreciate the range and variety of books the big stores offer, it is in dusty corners under piles of other books that I experience the thrill of a treasure hunt. The book cover of that edition was not particularly attractive but there was something in the blurb that convinced me to buy it. Back then, I had no idea who the author was. The cover on this post is from a newer version. A dark fantasy, Strangewood demolishes the delusions of childhood and mocks the icons of youth, and yet it reaffirms innocence and boundless joy and wonder. When Thomas was a boy, he imagined a fantastic forest peopled with magical creatures. He was The Boy whose imagination shaped the world, who played with talking animals and had adventures to foil the plots of the Peanut Butter Man and the wicked Jackel Lantern. In that world, good always triumph and evil is thrilling, never surpassing what a child cannot understand. On the surface, Strangewood is reminiscent of Neverland, the Land of Oz, the Hundred Acre Wood, and Fantastica. Thomas or Tom is the Peter Pan, Dorothy, Christopher Robin, and Bastian that we all wish we would be forever (at one point or another). But Strangewood is no Neverending Story and The Boy who kept the world innocent and light grew up to become a successful author with a troubled family life. He is recently divorced and the father of a five-year-old son, Nathan. His books are all about Strangewood and the adventures of his imaginary friends. But are they just imaginary? Nathan falls into a coma after claiming his imaginary friend has been murdered. Creatures from Strangewood now appear solid as anything in real life. They seem to be haunting Thomas, calling him back to Strangewood. All this strangeness is inexplicably linked to his son’s coma. He does find his way back to Strangewood only to see that it has gone dark. His former friends are unrecognizable from the sweet creatures they used to be. They are willing to torture and kill to reclaim what they want. There is blood and gore, all the ugly pictures of violence, made more shocking given the fairy tale setting and characters. Thomas’s absence from Strangewood has allowed an evil to take root, or perhaps it has simply taken charge again. I was horrified. All my tender feelings and illusions about cute ponies, dazzling dragonflies, and adorable teddy bears were not spared. I believe that we harbor some spot in our souls that wishes to preserve childhood and all its beauty. That’s why we have so many children’s stories reinforcing an idea that there is a refuge from adulthood and all its hardships, isn’t it? In Strangewood, Thomas the character and I the reader are faced with the reality that our childhood friends are as human as the rest of us. They can be selfish and may have ulterior motives. They make choices for either good or evil. Some readers may consider the use of talking animals in a horror story ridiculous. Not me. For me, Strangewood is a story of transformation, from child to adult, from adult to something that is more, with all the wonder and courage of youth and all the wisdom and determination of maturity. It is also about realization that innocence is not a matter of putting the blinders on, it is about choosing to love and believe despite all the ugliness. 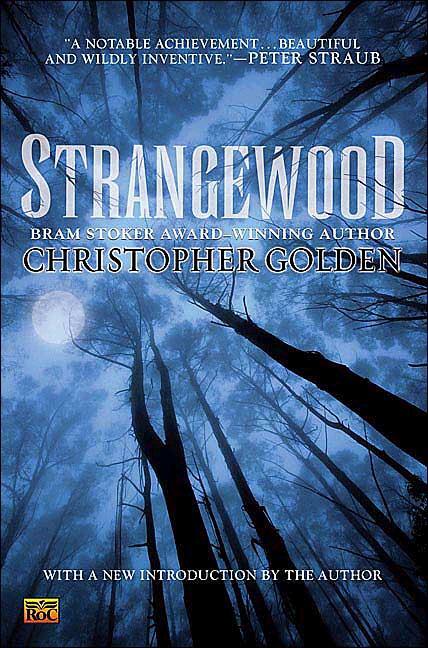 I think fans of Neil Gaiman, Stephen King and Joe Hill may like Christopher Golden’s Strangewood. I haven’t read his other works yet, but if the tone and writing is consistent across his other books then I would probably enjoy his other works as well.